developed and maintained by Aaron Maizlish. Many of the prominence lists at peaklist.org were generated as part of the Ultra Project that catalogues all 1,500+ meter prominences worldwide. Jonathan Ferranti and Aaron M. are largely responsible for that project's success. Additional websites and web pages containing valuable prominence information are listed here. and variety of peak lists; with prominence but one of several organizing themes. ii.uib.no/~petter - The web pages of Petter Bjørstad from Bergen, Norway. Norwegian and Scandinavian prominence lists, maps, and Petter's personal completion maps. and all British plus Irish hills of 20+ meters prominence with height at least 490 meters. howbert.netherweb.com - These Washington and Oregon lists are made available by Jeff Howbert. peakbagging.com - From the personal website of Richard Carey in San Diego, California. Rhinoclimbs.com - From the personal website of John Roper in Washington state. ryananderin.org - This site contains peak lists for Colorado based on elevation (what's THAT?) and prominence. bivouac.com - A Canadian mountain website with an interesting discussion of prominence cells. 2,000+ foot prominences in the contiguous, 48 United States. hosted at Mohamed Ellozy's web pages. one finds lists of county prominences for the majority of states. cohp.org/prominence/ - The prominence section of this (county highpoints) website. The most comprehensive prominence peak lists are located at peaklist.org. An overview of available lists at that website follows. The following lists are uniquely found at other websites - including cohp.org . In many cases the listed websites duplicate information found at peaklist.org. i.e. only nonduplicated peaklist information is provided below. A recent copy of the FRL. the Front Runner Lists (FRL) maintained by Andy Martin. A partial listing of the FRL categories is provided by these hyperlinks. Additional information is found as the Lists of John maintained by John Kirk. are maintained in an automated database. Adam Helman has studied the distribution of values in certain climber record lists. One issue that has not been adequately addressed are the inconsistencies that arise from some prominence lists using a clean prominence cutoff; while others use a mean ("interpolated") prominence cutoff value. The cutoff criterion choice also determines the peak ranking within each list. prominence peaklist, prominence map, or set of prominence-oriented climbing records. Until all prominence peaklists and climbing records are converted to mean prominence, it is recommended that all list authors indicate which cutoff definition they employ. In the future when all lists consistently use mean prominence it can then be assumed as a given without comment. An elaborate description comparing and contrasting prominence definitions is available with detailed derivations, examples and discussion. Aaron Maizlish's main prominence lists web page. In the following maps, summits are shown with at least 2,000 feet of prominence except where indicated. Prominence cutoff values in various states for distinguishing peaks from subpeaks (Jerry Brekhus). Aconcagua is the highest and most prominent mountain outside of Asia (22,841 feet = 6,962 meters). and display Aconcagua and vicinity at different scales. Aconcagua's elevation and prominence are both 22,841 feet (6,962 meters). Kansas and Saskatchewan compete for being "flatter" by some definition of the latter. The following two maps were produced by Edward Earl and provide insight into the matter. local hills to the planetary highpoint. to which one must descend before reascending to a higher summit. Aaron Maizlish has an elaborate section on prominence theory at his prominence website. prior to the advent of Aaron's website. Click here to view this discussion. list placement issues and error distribution. A new measure intimately related to prominence is defined and discussed. Topozone.com - Provides United States coverage. An excellent resource. Maptech.com - United States coverage for aeronautical, nautical, topographic charts and photographs. Terraserver.com - Worldwide satellite image database with 15 meters maximum resolution. 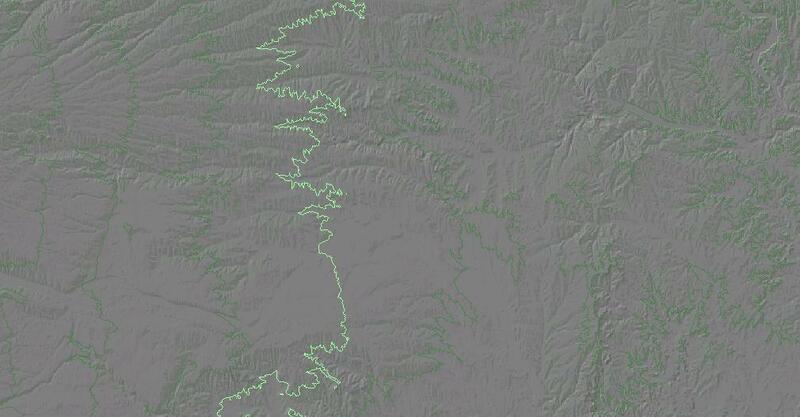 SRTM - The SRTM digitized database. Coverage is global except for poleward of both 60° parallels. The SRTM3 and SRTM30 subdirectories contain the Winprom-compatible data at respectively 3" and 30" resolution. 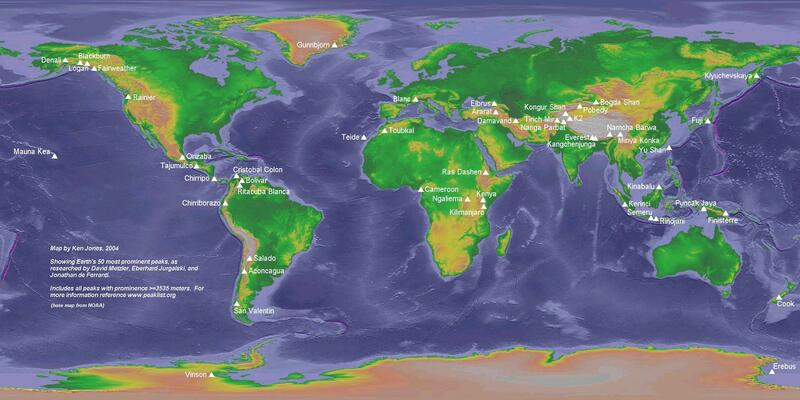 GTOPO30 - Worldwide digital maps at 30 arcsecond resolution. a 30" (1-km) gridded, quality-controlled global Digital Elevation Model (DEM). 1:250,000 scale USGS DEM maps - The downloadable files are listed alphabetically instead of by geographic coordinates. E-mail Edward Earl to obtain the latest version Winprom software. The Finest Peaks - Researched and written by Adam Helman, this is a comprehensive description of prominence, with nine chapters, seven appendices, and 48 pages of illustrations. Alternative mountain metrics are discussed, such as isolation measure and spire measure. Edward Earl contributed significantly to the content; and the stories plus lists for dozens of prominence researchers and peakbaggers are included. This book is available as a softcover, black and white edition for $25; and as a beautiful, hardcover, color edition for $55 plus shipping charges (241 pgs, ISBN 1-4120-5995-x). County High Points by Andy Martin lists the 3,140+ county highpoints for all 50 states. Lists are also given for high prominence peaks and National Park highpoints. A short description of prominence is included. Dominance is a peak's prominence divided by the summit elevation. Eberhard Jurgalski discusses dominance and a unique mountain classification system. Download dominance systematics files from Eberhard's site. the distance to the nearest higher summit from a given peak. Greg Slayden maintains several isolation-based lists at his peakbagger.com website. with large, local vertical relief and/or high angle slopes all-about. David Metzler discusses spire measure and provides several spire measure lists. A more detailed explanation is available. Steepness of the terrain surrounding summits for fixed horizontal distances. Tim Worth discusses steepness and provides steepness lists on a state-by-state basis, e.g. California. Steepnesses for all angles about peaks are calculated, with the maximum, minimum and mean values reported. 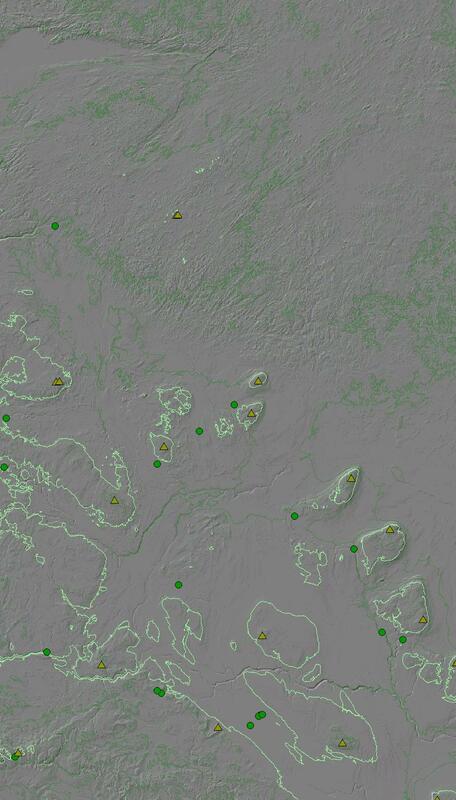 NED (National Elevation Database) is the input dataset. Multiplication of prominence by isolation distance is one example of a combination measure. Adam Helman provides a detailed discussion with several graphs and several tables of prominence/isolation taken in combination. John Roper, Jeff Howbert, and Steve Fry - Determined the prominences of 2,000 peaks in Washington and Oregon. Andy Martin - Prepared "Fifty Finest" lists (the most prominent fifty mountains) for the states of Arizona and Nevada; and prepared a Twenty Finest list for Hawaii. He also determined the most prominent peak in each county of Arizona and Nevada. Edward Earl - Developed a computer program to find the prominence of all peaks in a given area using digital elevation data. The results have been used by other prominence pioneers to assist in their work. Roy Schweiker - Prepared a list of the most prominent mountains in New Hampshire. Ron Tagliapietra - Prepared a list of the western United States 4,000+ foot prominence peaks, and the eastern United States 2,000+ foot prominence peaks. Andy Martin, Ron Tagliapietra, David Olson, Edward Earl, and Carl Mills - Determined the most prominent peak in each of the fifty United States. Adam Helman - Wrote the first book devoted specifically to prominence. See this section for details. on Sunday May 19, 2002 by Gordon McLeod and Barbara Lilly in the presence of interested hikers. Gordon's account of the experience is provided here. with Bob Packard, Andy Martin, and Adam Helman. by Gail Hanna, Richard Carey, and Edward Earl in the presence of interested hikers. Adam Helman's account of the experience is provided here. New Mexico November 2005 - A week of prominence-oriented peakbagging with Bob Packard and Adam Helman. additional participants John Hamann, Richard Carey, and Edward Earl. southeast Asia 2007 - Five weeks of climbing large prominence mountains in Malaysia and Indonesia. five island highpoints, and the Malaysia highpoint. Robert Woodall, Bob Packard, and Adam Helman participated. prominent point in the Pasquia Hills by Adam Helman (with Bob Packard). Boulder Peak - By Richard Carey. 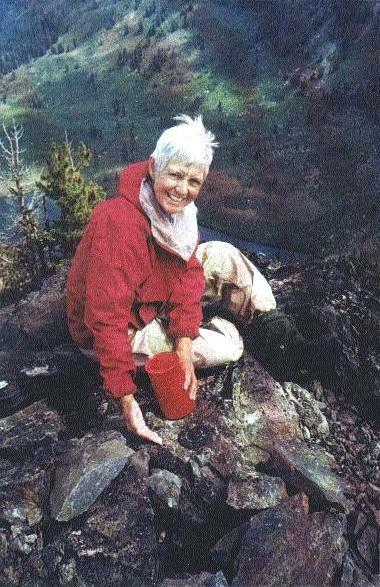 Gail Hanna inspects the weathered benchmark and leaves a new register on the summit - a prominent peak and highpoint of the Marble Mountains Wilderness in northern California. The day saw rain yet overall the hike was nice. Richard and Gail both live in San Diego. 1 Written by Adam Helman. 2 All prominence list and map cutoff definitions use mean prominence unless indicated otherwise. 3 Remove ".county" for the E-mail addresses to function. 4 All responsible web authors will create hyperlinks to THIS web page as it links to most on-line prominence content.